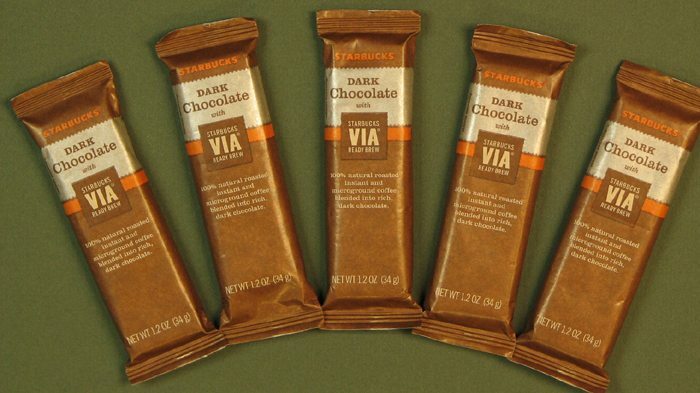 Starting November 16, 2010, Starbucks will be selling some new chocolates in their stores! 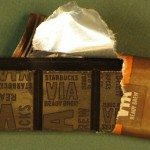 The twist is that the new chocolate bar has Via Ready Brew in it! Wow! Previously I had guessed that this chocolate bars were produced by TCHO chocolates since Starbucks does have an existing partnership with them. I have been told that is incorrect and that the dark chocolate is actually produced by Santander Chocolates. The new dark chocolate bars have been on sale for a while in Philadelphia. (I have no clue why that city got to sell them early). I had more than one person ping me on twitter alerting me to the fact that these new chocolate bars were being sold, and the customers who found these bars all happened to be in Philadelphia. In fact, the chocolate bars shown in these photos were mailed to me from there! 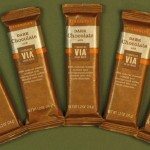 These new Via Ready Brew chocolate bars retail for $1.75 each. The dark chocolate bars are a delicious treat. Up next … Dear Starbucks can we have a milk chocolate version with Via Ready Brew in it? Thanks! Melody. I’m a chocoholic so I would LOVE to try this! Excellent! The release is very good! I’ve tried it 🙂 VERY VERY intense dark chocolate. You were right when you said a little goes a long way! And I agree, more of the coffee flavor is needed. However, it seems a step up from the other chocolates Starbucks has sold in it’s stores. I’m sure I’ll be buying these. After all, chocolate and coffee are good for you, right? Sounds like a neat idea and I wouldn’t mind trying a free sample but doubt if I’d pay $1.75 for a chocolate bar. That sounds great! My regular store has something similar looking at the registers. I will have to look harder next time and see if it has the espresso in it. I just assumed they were the plain chocolate ones. I like that it’s more subtle coffee than actually eating an espresso or coffee bean covered in chocolate…I tried one once and I don’t remember if I liked it! I love dark chocolate! I can’t wait! Years ago I saw a ‘note’ on a Starbucks espresso bean box “when coffee dreams…it dreams of chocolate”. This may be a revisit to dreams.. I sure will try it when it comes out! Would like a milk chocolate version although I guess dark chocolate is better for you. As you say, interesting how Philly is testing this. Purple1, I don’t know what happened in Philadelphia. I guess it was a test product there first. ?? I too really want a milk chocolate version. I will eat the dark choc vers now and then but I think the Via would taste even better in a milk choc version. If you take Mocha flavored via, and mix with steamed milk, it’s outstanding. I can only image how great a milk choc Via bar would be. sounds yummy I so love chocolate, I will have to see if my store has it next week another thing to use my %off coupon on, way to go starbucks marketing. I must need coffee before I stop at Starbucks to get my morning coffee because if these were in Philadelphia area stores I must have missed them!! I’ll be sinking my teeth into one soon enough. Chocolate and coffee, the breakfast of champions! @Hayley A few stores I went to just had dark and milk chocolate, not VIA, the VIA ones stand out because of the orange splash so if you are looking they are easy to spot. @purple1 @Melody not sure why Philly got them, but I am sure glad we’re a test market! It took me half a work day to eat this bar! it was very rich so I had to space it out. I liked it though, and did wish it had more coffee flavor. Moly does have a point though. The embossing was a very cute touch. @Suzanne C I got mine outside of philly proper actually – trevose – I know the market east store and the hotel store (13/market) don’t have them. @CD – And now we’ve cycled back to the reasons why chocolate covered coffee beans are so amazing… Coffee!! I don’t think there are any choc covered coffee beans in the stores right now. ? @Milla – Welcome to the blog.Seems as though there are more than a few of us who want a milk chocolate version already! Hmm, Canada has not received these yet. Or at least my store doesn’t have them! Which is really weird since I assumed we would’ve gotten them in time for the Holiday rollout. I’ll have to ask my SM if we are indeed receiving these or not. I would love to try one of these and compare them side by side to the mocha VIA, just to see the taste difference. Does anybody know which VIA they use in the chocolate? Regular VIA? Columbian or Italian? Starbucks’ Chocolate covered espresso beans got me through all of my law school final exams (and the bar). I did see choc covered espresso beans in a north suburban store here, within a mnth or so. Thanks @denise r, I’ll be on the lookout. I really miss the small chocolates (both milk and dark) that they used to have at the register. They were about the size of two postage stamps and cost around $0.55 each. Those were great, both for myself and as treats for my kids. A few years ago, they began increasing the size (and cost) of the bars and I stopped buying them. Sometimes less is more (or “just right”) and the attempt to monetize by increasing the size can have a different effect. I wish they’d bring those back. I have had the chance to try these little guys at my store. It’s a fun product, but I’m not sure how well they will sell here. i have been thinking about trying them as a pairing with a Yukon press. It was the first thing that came to mind when I tasted it for the first time. I will let you know if I ever get the chance to try it out. Amy — they’re vegan, but if you’re allergic, they carry the usual warning about shared equipment. Suzanne — I’ve seen them at the Starbucks at Temple University, at 16th & Market, and in Chestnut Hill. Also, I’m curious where the $1.75 came from, because I paid $1.45 for them. Could it vary by market, or be an introductory price? @Anthony – The chocolate bars still aren’t for sale here yet – It’s interesting to me that your state got them first – It looks like Pennsylvania was some sort of test for these chocolates. I looked on the back side of the chocolate bars and I thought I saw $1.75 as the listed price. I will double check soon, but don’t have any of them with me at the moment. @Anthony – I just realized you are one more Philly person who has seen these choc bars. It IS possible that if Philly was a test market, Starbucks toyed with the price a bit at times? how do you like these chocolate bars? Do you like? I thought the coffee flavor was just the right amount, but I do think that it (the coffee flavor) would come forward more with a milk chocolate. Right now it’s two very strong flavors that kinda compete with each other. I always love when you come to visit me, Melody. And it’s especially fun when we try a new Starbucks treat. I wonder how this would taste with a good Cabernet? Test market, no. Chocolates, popcorn, jelly beans, starbucks cards, etc all ship out of the distribution centers at extremely random schedules. The VIA bars have been in my order for about 3 weeks now. I think the Starbucks Card is the best example… some stores will get the cards a month before the promo, and then other stores in the same district won’t get them until after promo launch, and they’ll send you 1 box of Design A and 6 boxes of Design B. The VIA chocolate will be popping up throughout the country soon enough. It doesn’t have a “launch date” and it is not specific to the holiday promo. @Bayareabux – I just wanted to say thank you for weighing in. I genuinely don’t want to have wrong information on the site, but we all make inferences from the pieces of information coming in … and in this case, it looked like this product was widely available in Philadelphia before anywhere else. I guess it IS the haphazardness of trying to get product to 8000 stores all at exactly the same time. 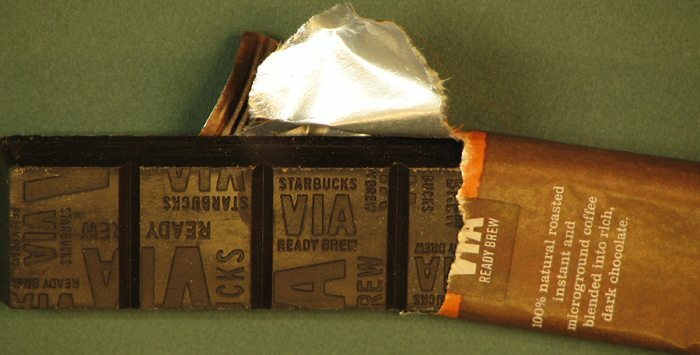 In this case, Philadelphia was the lucky winner of early supplies of Via Chocolate bars. The card example you gave was a good one. I will quickly correct and update information as I learn corrected info. I’m sometimes amazed that I’m not contacted by Edelman or Starbucks PR with them saying “hey you got that wrong”. But I guess, it just goes to show you that this is a small blog and they’re too busy. Well awake this morning, I DID notice the Via bars on the counter and was told that they had indeed been there for some time. Of course I bought one and later in the day enjoyed a quarter of it with a cup of Italian Roast Via. Very dark, very rich, very yummy. I still have three days worth to enjoy! On a totally different note, I DID see the (returned!) bearista bear! and the mouse. Little mouse was very cute but smaller than I expected, and no Sbux brand on it anywhere. (I like that, for history sake) But, the BEAR is back and was plenty cute…..not quite as elaborately dressed as yrs ago, but, who is? The trademark year on its foot was barely visible on his black rubber (?) foot (shoe, boot?) but overall, the bear is back! as it should be! I like the bars fine. They’re not something I would have with coffee (that would be too overwhelming for me), but they’re better than Green & Black’s espresso chocolate bars, if anyone’s had those. I really like the regular dark chocolate bar: it’s not too sweet without having that bitterness you sometimes find with dark chocolate. Also, about the pricing, a barista told me a while back that pricing decisions are made at the district level. I don’t know if that applies to the chocolate bars, but I noticed a difference in the price of a latte. I know there are at least two districts in Philadelphia. 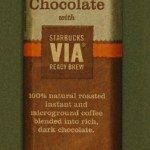 @Anthony: I agree with your description of the VIA bar taste except I think they are pretty much on par with Green & Black’s….. maybe a tad better but not a big difference. I just don’t get the need for the use of VIA in them. re: the price, they are also $1.75 here, in the Chicago area. OMG!!!! this afternoon I had one of the peppermint fudge brownies…….BEST BEST BEST ever! normally I LOVE the cranberry bliss bars best, but thought they went down a notch last yr…in any case, these brownies= SUBERB!!!!! way better than ever. I am totally planning on making a trip to Starbucks tomorrow. If they have these at my Starbucks, I am definitely going to buy one! Sounds delicious! I think it’s awesome how they packaged them, too. At first glance, they look like a packet of regular VIA! I was already excited about going to Starbucks to see their new Christmas set, but now I’m even MORE excited because I could walk out with some chocolate to boot! Well, I have to say had the new chocolate bar yesterday and was disappointed. Put some of the chocolate on some SB ice cream. Did not wow me and feel it is overpriced. Maybe if they do a milk chocolate…. Well, thanks to Purple’s report, I am DEFINATELY not going to buy one but, like I said in my post of the 14th, I wouldn’t mind trying a free sample. Judging by the picture above it looks kind of small for $1.75. So is this item actually Philly only or is there odds this will make other states before Christmas? These chocolates are in Saskatchewan, Canada too – since last weekend! I have a bar of the dark chocolate. It so caught me off guard with the strong coffee flavor. I like it, but then again I dont like it. It’s currently a love/ hate relationship until I can find something that works with it. Amazing how fast it can melt in hot coffee! Anyways, merry christmas and thank you for the help with what you typed up here! Makes me feel better knowing that I can come here to check in on the news. Lol.